Presidential Spokesperson Atty. 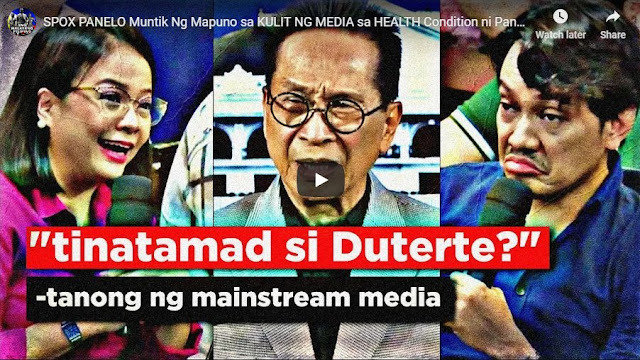 Salvador Panelo burned down GMA Reporter Joseph Morong and other reporters for their malicious questions regarding the health conditions of Pres. Rody Duterte. Joseph Morong even greeted Spox Panelo with the greetings "Happy Easter" which probably means the rebirth of Pres. Duterte because he was reportedly ill and succumbed to death during the past few days. The controversial GMA News reporter Morong was quoted as saying "Sir Happy Easter, You know why?" "Yesterday, the, Miss Honeylet had a Facebook live of the President," Spox Panelo answered by saying "Ya, dahil maraming makulit, na nagtatanong." Morong added further that "Why do you think is there such a need for the President to come out." Spox Panelo answered "Because the social media is bashing with so many speculations. She feels it was necessary para matapos na kaagad yong tsismis." Spox Panelo stated. Joseph Morong insists on his questions by suggesting that "wouldn't be easier if the President just provide the medical report?" Spox Panelo this time around burned Joseph Morong down by saying: "No! bakit naman medical report, nagpahinga lang medical report na kaagad, pag serious illness lang." The controversial reporter continued his controversial questions on the persistent rumors. Spox Sal Panelo clarified further that "Eh kasi yong mga makukulit, you know they cannot accept the fact that this President, appears to be industructible and apparently immune from any illness despite his punishing schedules, they just killed him in their minds." Aside from Joseph Morong who was burned down by Spox Salvador Panelo, the veteran lawyer and Presidential Legal Adviser, Atty. Panelo also burned down CNN Philippines senior correspondent Ina Andolong.